For those who don’t know, QR codes, or “Quick Response codes,” are one of the most popular ways to get the most from your offline promotions and traditional media. QR codes within the packaging of your products allow your customers to unlock additional online content and learn more about your products. Promotions within magazines can now easily be tracked in order to see which publications your customers are reading and where they are most likely to purchase your products. People even use QR codes on their Business cards to promote themselves. Wouldn’t it be great if you could add intelligence to the link that powers your QR Code in order to route all of your customers to the best possible destination no matter where they are or what device they are using at that time? All of your geni.us links now have the option to generate a custom QR code that can be used anywhere you promote your products. Selling consumer packaged products within physical storefronts? Add a Geniuslink QR code to the packaging, and automatically send your potential customers to learn more about the product in their local language. Using a business card to help drive traffic to your Amazon Author page? Make sure your potential readers are sent to the correct Amazon storefront by using a globalized Geniuslink QR code. Promoting your newest album in Rolling Stone Magazine? Send your listeners to a beautiful User Choice Landing page to give them the option of where to groove to your new tunes. At a trade show? Add a QR code to the goodies at your booth to pixel people who want to find out more about your product, giving you a remarketing list for later advertising. Want to know how many people attend your marketing event? Add a different QR code on your handouts for the sessions to see what sessions people are most interested in then they “click” for more information. 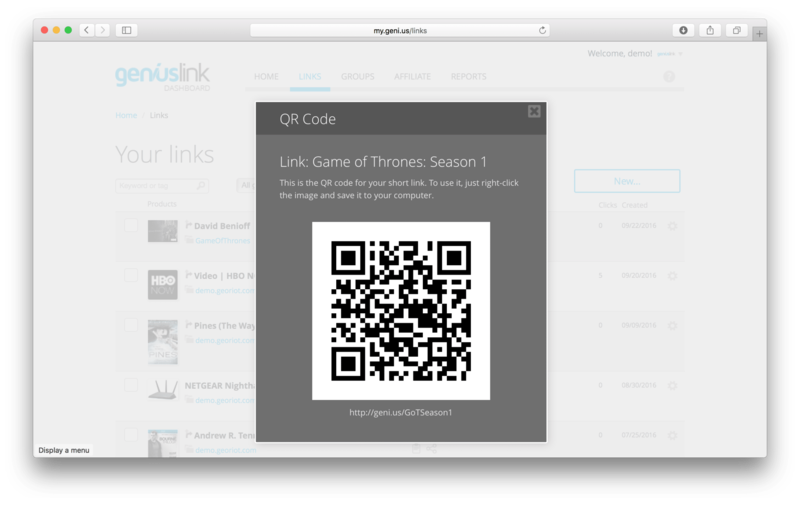 No matter where you choose to promote your products, make sure that your customers are given the best possible experience by using a Geniuslink powered QR code. To get started, simply navigate to the Links page within your Geniuslink dashboard, click on the Share icon, and select QR code. Your customized QR code will instantly be generated, and you can simply save the image and use it anywhere your heart desires! Are you using QR codes in a unique way that has helped your offline marketing campaigns? We always love to hear from you, so please feel free to share in the comments below! Subscribe to get our free video course.